I attended an event where we cleaned out the science warehouse for our school system. I got a lot of great stuff for my elementary science classes, including a box of rock and mineral samples that have little stickers with letters or numbers. I’m sure at some point there was a key that told what these meant, but it is long gone. Do you have any suggestions about how I can identify these samples? Teachers always are on the look for classroom resources, especially if they’re free! You’re experiencing one of the drawbacks of free stuff with your keyless rock collection. You could take the samples to your high school earth science teacher, a natural history museum, or college geology department for assistance. But I’m seeing this as a learning opportunity for both you and your students. Instead of getting someone to label them for the students, how about identifying them with your students? Your students may rush for the field guides right away, but I had an experience that showed the value of careful observation and discussion. A few years ago I was working on a project at the Cornell Lab of Ornithology and we went on an early morning bird watch with one of the ornithologists (who was from Europe). He mentioned that when American birders see a new species, they immediately start looking at the field guide to identify it. He said that in Europe, they spend a few minutes writing down or describing the characteristics to each other – for example, the bird is smaller than a robin and has white wing bars, a yellow throat and rump, and a white eye ring. Then they match their observations to the guide. The discussion and analysis are essential to a good identification. So with this project, since you’re focusing on processes rather than rocks per se, you might want to give each team two to three rocks and a hand lens and have them record the characteristics (color, texture, etc.) on notepaper or a chart before you give them guide books or a dichotomous key. This way they’re observing and discussing first (just as we learned on the bird walk), rather than fretting over the “right” answer or trying to be the first to finish. Based on my personal experience, make sure the stickers are firmly attached to the samples and take a photo of each before the activity. You might have a few jokesters who switch the labels! It would be interesting to find out how students react to the fact that you do not have the “correct” answers but are part of the research team. I hope that you’ll let us know the results of your project. 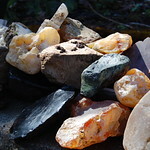 I’ve created a resource collection with a sample page for notes and NSTA journal articles on rocks and rock collections. This entry was posted in Ask a Mentor and tagged activity ideas, Earth science, elementary, geology, inquiry. Bookmark the permalink. Trackbacks are closed, but you can post a comment. Prior to becoming a teacher, I worked as a geologist. Rather than using stickers, dab on some white out and use a Sharpie to number the samples. If your kit includes minerals (or even if there is a larger area of a particular mineral in the rock) I would also add streak tests and simple hardness tests to your activity for the students. I’ve done it with 4th graders and 8th graders. Unfinished porcelain plates are used to find the color of the mineral in powder form, and a penny, steel nail, and make-up mirror can be used to test the hardess. Have fun! You might also look at my NSTA Press book “Bringing Outdoor Science In.” The free chapter available on the NSTA science store web page is all about rocks & has lesson ideas that may be helpful.